How to Play Blu-ray/AVCHD (*.m2ts) Video Files on PC or Mac? How to play Blu-ray/AVCHD (*.m2ts) files on Windows 9/8/7/vista/xp? To enjoy the Blu-ray/AVCHD (*.m2ts) video on your wide screen, you need a professional Media Player software tool to play the Blu-ray/AVCHD (*.m2ts) video. UFUWare Blu-ray Player Software is the most wonderful Blu-ray/AVCHD (*.m2ts) Player software for movie fans, which has powerful playing function to play any video with unparalleled image quality and audio effect. Unlike other Media player software, its stability decides that you can enjoy the much more fluent video image without any standstill or jump. This Blu-ray Media Player software can not only play Blu-ray disc, Blu-ray folder, and Blu-ray ISO image file, but also play HD video and other popular video file like MTS, TS, M2TS, MXF, MKV, MOD, RMVB, VOB, and WMV, etc. How to play the Blu-ray/AVCHD (*.m2ts) video with this Blu-ray/AVCHD (*.m2ts) Player software? This guide would show you the detailed steps of playing the Blu-ray/AVCHD (*.m2ts) video on Windows (including Windows 9, Windows 8, Windows 7, Windows Vista/XP) with this software. 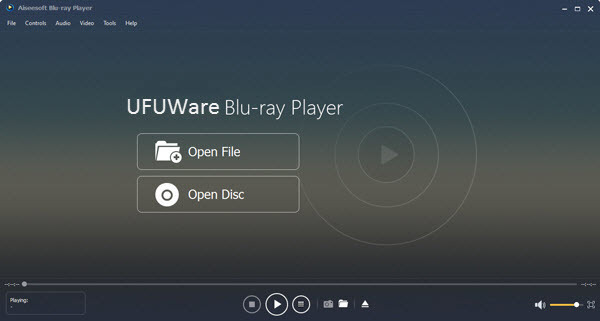 You can download UFUWare Blu-ray/AVCHD (*.m2ts) Player software and install it on your computer, and then launch the Blu-ray Blu-ray/AVCHD (*.m2ts) Video Player program to open it. Click “Open File” button to select the Blu-ray/AVCHD (*.m2ts) video to the program, and the program would play the Blu-ray/AVCHD (*.m2ts) video automatically; you can enjoy your Blu-ray/AVCHD (*.m2ts) video on your wide screen. If you want to choose the next Blu-ray/AVCHD (*.m2ts) media file to watch, you can click “Stop” button to come back the main interface to open the next Blu-ray/AVCHD (*.m2ts) file on Windows (including Windows 9, Windows 8, Windows 7, Windows Vista/XP) .